WC Piguenit’s The upper Nepean is back on display following conservation treatment that has returned its gorgeous golden frame to its former glory. The painting, in its gilded frame made by Sydney’s great 19th-century picture-framer Henry W Callan, was first displayed with the title The upper Nepean, N.S.W. at the Royal Society of Artists then bought by the Art Gallery of NSW in 1889. The frame’s style is neoclassical cove – a term used for a concave moulding of greater size or concavity than a quarter circle. It has been constructed from timber moulding and enriched with ornaments made of 'compo’ or composition material. 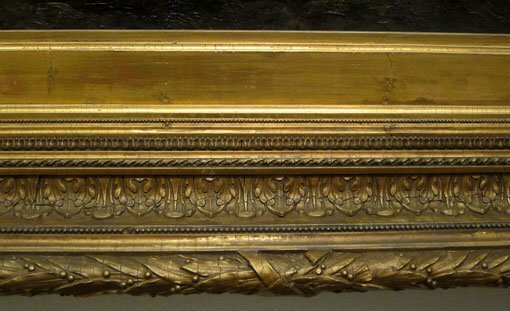 Originally, the frame had been water gilded using pure gold leaf with a matte and burnished finish. However, at some time, the entire surface had been painted over with brass-based paint, which had badly oxidised, making the frame appear dark and dull. Some of the ornaments had also been lost. 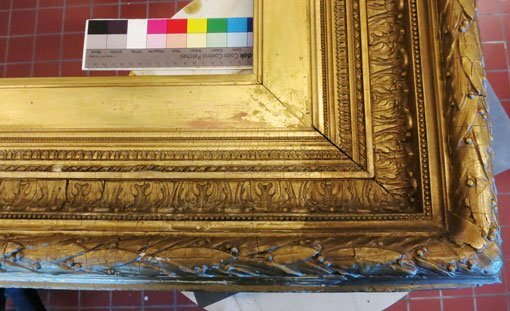 This year, in a six-month frame conservation project sponsored by Friends of Conservation, the brass-based overpaint was removed while retaining the original gilding underneath, and missing ornaments were replaced by senior frames conservator Barbara Dabrowa. Before treatment, the frame appears dark and dull. The painting itself also had a discoloured varnish layer removed by Paula Dredge, the Gallery’s head of painting conservation, as part of our Gallery-funded work on the collection. As a result, the work’s appearance changed, from almost honey-coloured to a much cooler palette of silvers and greys. The incredible green of the trees in sunlight was intensified, and the power of the horizon line, where the sun hits the water, was reasserted. Details, such as small human figures near the water, also became more evident. After removing the discoloured varnish layer from the painting, the incredible green of the trees in sunlight was intensified. 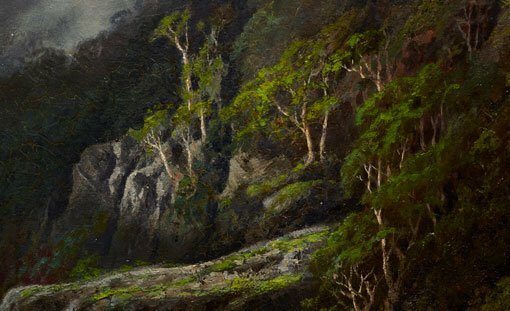 You can see the results for yourself in our 19th-century Australian galleries, where the work is displayed alongside another great romantic landscape in the European tradition – Eugene von Guérard’s Milford Sound . William Charles Piguenit is often credited as the country’s first Australian-born professional artist. 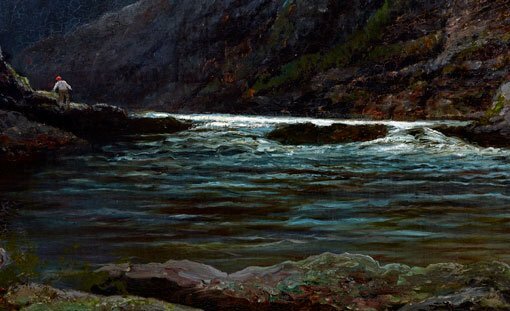 He delighted in mountain scenery and often chose dramatic subjects for his paintings. Born in Hobart in 1836, he worked as a draftsman in the Tasmanian Lands Department Survey Office before becoming a full-time painter in 1873. 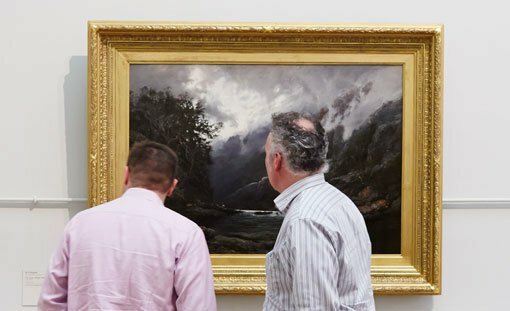 He moved to Sydney in 1875 and in the same year the newly established Art Gallery of New South Wales bought his Mount Olympus, Lake St Clair, Tasmania, the source of the Derwent – the first oil painting by an Australian artist acquired by the Gallery. In 2012, we undertook a major conservation project on another of his paintings The flood in the Darling 1890 .